In this tutorial you’ll learn how to create an albedo map from a photographic texture using ShaderMap. Albedo maps are commonly used in Physically-Based Rendering and serves as the color input also know as the diffuse map. 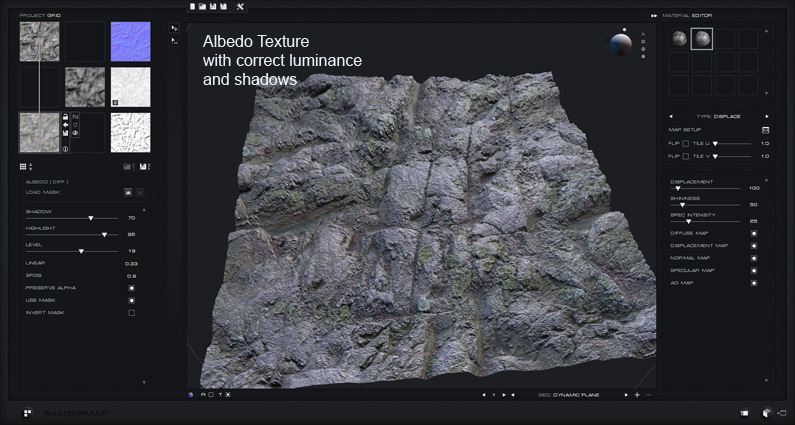 From the Start Screen load the texture you want to convert to albedo as a Color Texture. Allow the default maps to be setup. In this example I will be using a Rock texture which can be downloaded at the bottom of this tutorial. Step 2: Add an Albedo Map to the Project Move your mouse over an empty cell in the Project Grid. Click the plus (+) button to bring up the “Add Node to Project” dialog. 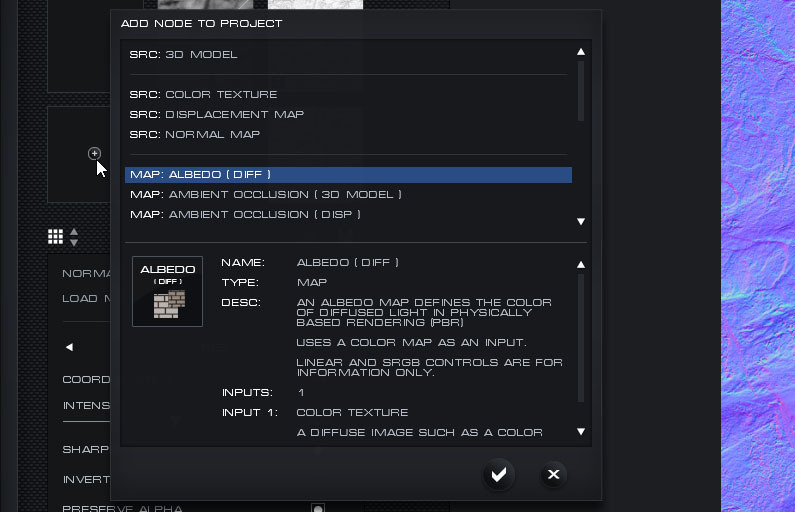 Scroll down and find “Map: Albedo [Diff]”. Double-click the map to add it to the project. 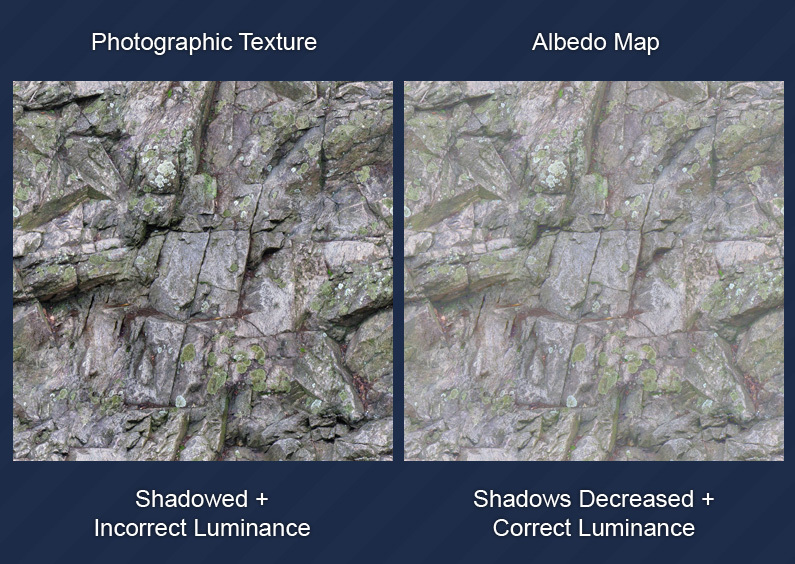 An important part of PBR albedo maps is that they have the correct luminance value for the material. In this example I am working with a rock texture, I know that Rock generally has a linear luminance of 0.33 and an sRGB luminance of 0.6. Using the “Level” control I can adjust luminance of the image which is displayed in the properties “Linear” and “sRGB”. Below you can see two displacement materials applied to the ShaderMap dynamic plane geometry. The first uses the original texture is the diffuse channel and the second material uses the albedo as the diffuse. Notice that the albedo map allows for variance in the scene lighting as the shadows and highlights are not baked into the texture. 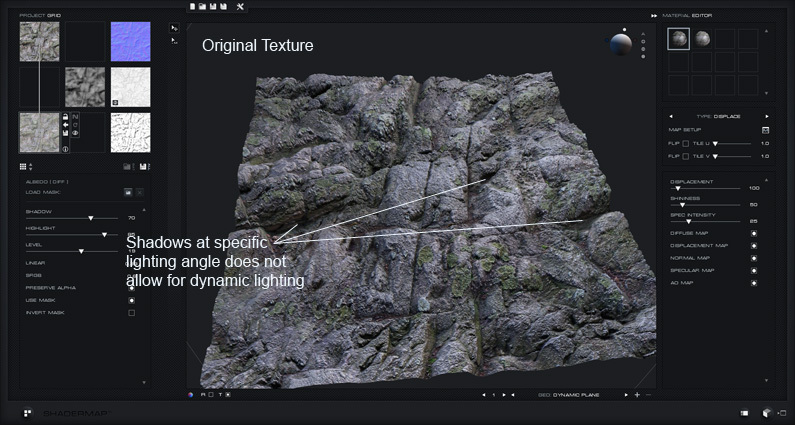 Using the correct luminance creates a more realistic simulation of rock. The same lighting and material settings (except for diffuse map) are used on both renders. ShaderMap creates and converts rendering textures to different formats. It can also bake maps from 3D models. Easily tweak settings and preview changes in real-time. For more information see the Quick Start Tutorials in the ShaderMap Docs.